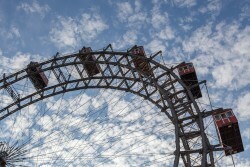 On the 7th of April 2016 the Vienna Prater amusement park (Wiener Prater) will be celebrating its 250th anniversary, so it has already started to undergo a major revamp. According to its new president, Stefan Sittler-Koidl, the winds of change are literally blowing through this traditional leisure park. The highlight of the season will be the commissioning of the world's most advanced wind tunnel, in which free-fall can be simulated. With new absolute record figures for inter­national enterprises moving to Vienna in 2014, the city has been able to strengthen its position as a business location and a hub for trade between the East and West.